Esl1 expression pattern and skeletal dysplasia in Esl1–/– mice. (A) Skeletal preparation (Alcian blue and alizarin red staining) of P3 WT (right) and Esl1–/– (left) mice. (B) H&E staining of P1 WT and Esl1–/– femur sections. Blue arrows indicate PZ; red arrows, HZ. The lengths of the HZ were separately confirmed by type X collagen (COL-X) immunofluorescence and quantified (n = 5). (C) Safranin O staining on P3 femur sections showing increased ECM deposition on mutant growth plate. (D) Esl1–/– chondrocytes in the P1 PZ of femurs show decreased proliferation compared with WT chondrocytes (n = 12) by BrdU incorporation assay. (E–G) In situ hybridization of Esl1 RNA probe in the skeletal tissues. At E16.5, Esl1 is highly expressed in perichondrium (PC), periosteum (PO), surface of joints (JT), tendons (TD) in the limb (E), PC and PO of rib and vertebrate (F). 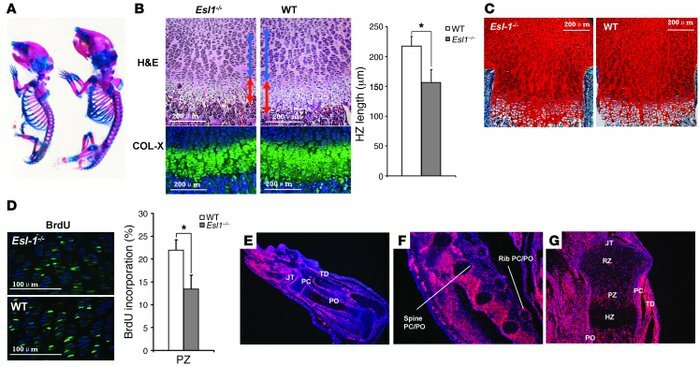 (G) In P1 limb, Esl1 is highly expressed in PC, PO, JT, and the PZ of cartilage, but less so in the RZ and HZ. *P < 0.05.